The living room expands into a comfortable dining area and then into the kitchen. The kitchen is stocked with all new appliances and ample counter and cupboard space, ready for any culinary expedition. The property’s well provides fresh mountain water; cleaner than bottled water. The stairs lead to the three bedrooms on the second floor. Two bedrooms feature a queen sized bed, the third has three twin bunks for a total of 6 twin mattresses. There is a second TV in one of the bedrooms, as well as a full bathroom on the second floor. The surrounding environment stuns and the inside of the house offers the same level of mountain inspired beauty. The home opens up into the well lit living room, with a cozy fireplace, a large, flat screen TV and plenty of seating space for everyone. Wood accents illuminate the space with a warm light. 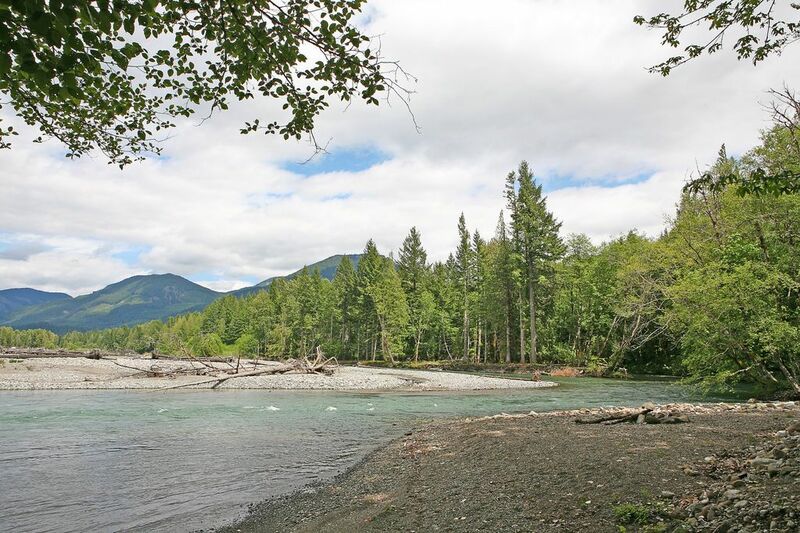 The Alpine Adventure Lodge has an oversized two car garage and a trail for easy access to both the Cowlitz River and a community covered picnic area situated right on the river. Enjoy the glistening aqua waters and the fantastic view of the mountains, while snacking on your favorite picnic foods. When booking any of our Packwood properties, you'll have access to some of the most exciting adventures in the state of Washington. Packwood is just a few minutes from Mt. Ranier's Steven'c Canyon entrance where you can hike the trails, enjoy the scenic views or watch wildlife. Depending on the weather, your options may vary. Take a hike, ski the mountains, go fishing or snowboard into the snow during the Winter. The town itself offers some exciting fun as well whether you're looking to relax or just escape the city life and soak up the quaintness of a small town. Here you can enjoy flea markets and a variety of shows ranging from automobiles to arts & crafts. During the colder months, Packwood has a Christmas festival as well as a Winter Carnival which attracts everyone who wants to indulge in a little holiday spirited fun. Here at Crystal Cabins Vacation Rentals, we vow to make booking with us simple and exciting. We know that booking a rental property home for your vacation can be unfamiliar territory for some, while others know their way around it. Because we know this, we ensure that each of our properties are up to high quality standards. Loved this house. 20 to 25 minutes away from White Pass made it convenient for those of us who ski and snowboard. Penny's place was super comfortable, cozy and a great location. Everything was incredibly clean and the kitchen was well stocked with appliances, crockpots and other cookware. We'll be back! Great get away with plenty of space. The hot tub was definitely a huge plus. Fantastic house with lots to do. We had an amazing time! love this property in a best location to visit mount rainier! Everything is good, the property is located in a very nice place. I love it. Overall we had a good time, the house was very clean and nothing broken, etc. Our family of 4 stayed for 4 nights in this house. The house appeared to be only a few years old. All the rooms were super clean; beds and towels were comfy. There were plenty of pots & pans, bowls, cups, and silver wares. Groceries, gas and food were only a few miles down the road. The location was great for day hiking Stevens Canyon trails, Paradise and Sunrise. The hot tub was an added bonus to relax after long hikes. A very small quibble is the two locks: One on the wall containing the key and the other one on the door - They could be very finicky and hard to open/close. Our family had a great stay. We hope to come back again.